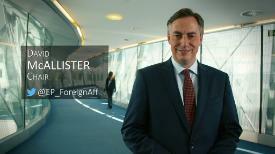 Welcome to the website of the European Parliament's Committee on Foreign Affairs. Amid the growing number of challenges but also opportunities we face outside the European Union, the 73 Members of this committee contribute towards the definition of the EU's foreign and security policy and scrutinise its implementation. We focus on the way European funds are used and our support is required for all international agreements signed by the EU. We always seek to uphold our citizens' interests and values abroad, working closely with our committee's two sub-committees on Human Rights and Security Defence. I invite you to explore the pages related to our ongoing work in which you will find the details of the MEP(s) in charge of preparing reports that will be discussed in this Committee before a possible adoption by Parliament' s plenary. The vast majority of our meetings are streamed online and some of the expertise we rely on to make informed decision can also be found on these pages. Policymakers work for all Europeans - feel free to get in touch with us and we would be more than happy to discuss the EU' s foreign policy and our role in shaping it for the benefit of the citizens we represent.